Have you ever woken up in the morning and thought that your jeans felt a little tighter than they should have? Did your husband leave the laundry in the dryer too long… again? You immediately turn to the mirror and your old friend also betrays you, making you look like you’re carrying a little more “heft” than you were yesterday. It’s not the mirror’s fault any more than it is the dryer’s (or your husband’s). If you eat a meal loaded with sodium, you will gain water weight almost instantly. To get rid of excess water weight, try consuming an all-natural diuretic. No, I’m not talking about a pill. 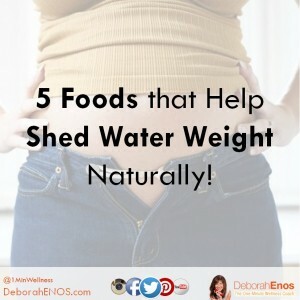 Here are 5 foods that will help you shed that water weight naturally. Parsley – Parsley is a mild diuretic and can help draw excess water out of your system. Chop it up and add to your salad. It makes your salad taste great and it’s loaded with antioxidants. Watermelon – This ultra-hydrating fruit is also a fantastic diuretic. Try it as an after dinner snack to mitigate the effects of a high sodium meal. Cucumber – This veggie rids the body of old waste and other toxins. It has a high water content which makes it a great choice for a natural diuretic! Grapes – Not only do grapes have a high water content, they are also rich in potassium and fiber! A great snack to cleanse your system. Celery – Celery is another food that is rich in water, which will have you heading to the bathroom more often, flushing that sodium out quicker. Feeling extra bloated? Boost your efforts and create a watermelon salad with four of the five foods at once! Here’s a great recipe that combines four of the five foods and looks as good as it tastes!